An opportunity to get up close to items that are rarely on show to the public with a specialist tour of both the Society’s premises and nearby Emery Walker’s House. 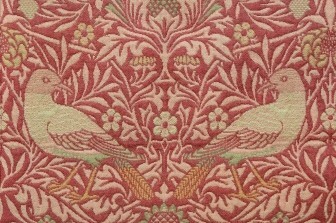 The tour will explore the Arts & Crafts textiles in both collections, including exquisite examples of May Morris’s work. 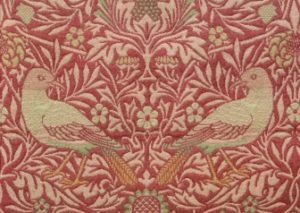 The tour will start at the William Morris Society, where you will be led by textiles and embroidery expert Sally Roberson. It will begin with an introduction to the William Morris Society’s textile collection, followed by tea/coffee and biscuits. A short walk along the river will then take the group to Emery Walker’s House (7 Hammersmith Terrace) where you will be able to view and hear about the textiles in situ at this recently restored Arts & Crafts gem. Due to space constraints at Emery Walker’s House, places are strictly limited to 8 per tour. PLEASE NOTE THAT KELMSCOTT HOUSE ITSELF IF PRIVATELY OWNED AND NOT OPEN TO THE PUBLIC. The Society is based in the Coach house and Basement. School groups and private tours are welcomed. Sign up to receive our e-mail updates and be informed about new events, publications and Society news.